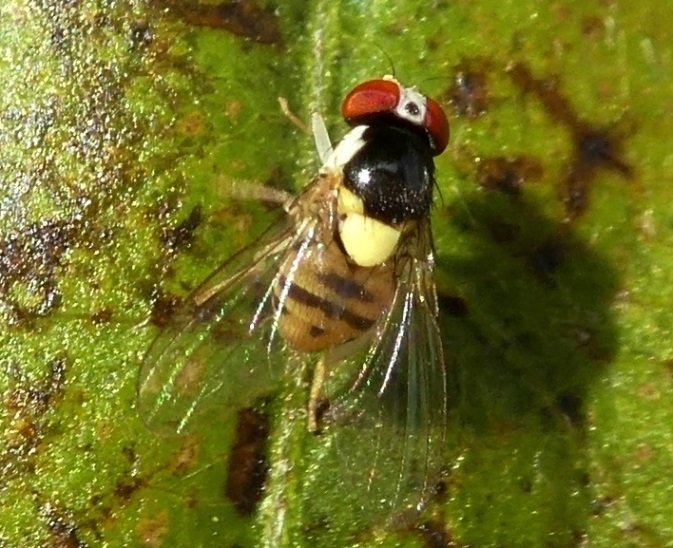 Diptera.info - Discussion Forum: Can anyone ID this fly, please? Can anyone ID this fly, please? This tiny fly (maximum 2 or 3mm long) appeared in my Leicesetrshire (UK) garden on several sunny days throughout October 2018, resting on different plants. I have tried to identify it without success, and am not even sure of the Genus. I have never seen this before. Any suggestions would be very helpful. Thanks. Example: File name is wrong, but filename is good. Thank you. I have now successfully uploaded the photo - which apparently had been too large. Acletoxenus formosus. A rather uncommon species, and there is a good news for your garden - the larvae of this fly are predators of Aleurodoidea. Thank you very much for your help. Mystery solved!